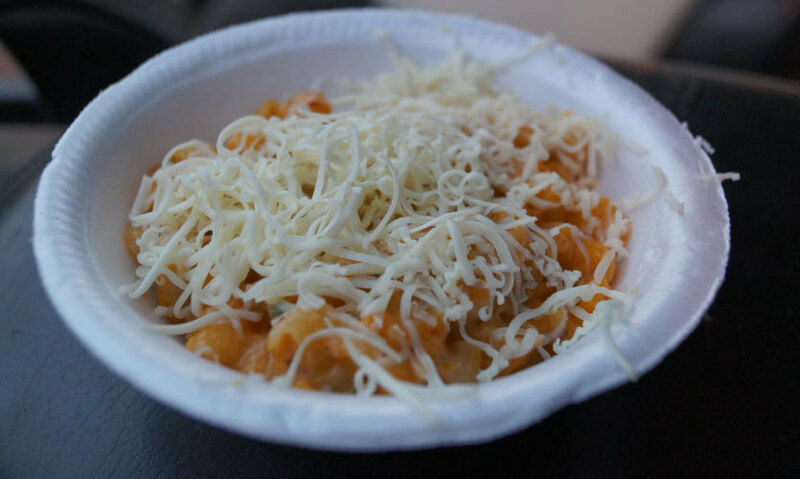 #FoodReview: We Swaggered With Our Maggi-Hungry Bellies Over To Kalkaji's Maggi Point! 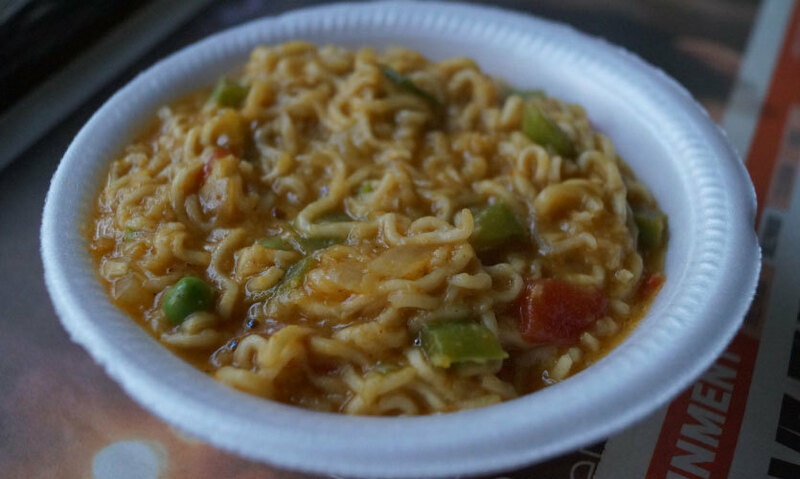 Maggi, in its comeback avatar, is almost the same as the old one, just a tad less spicy. 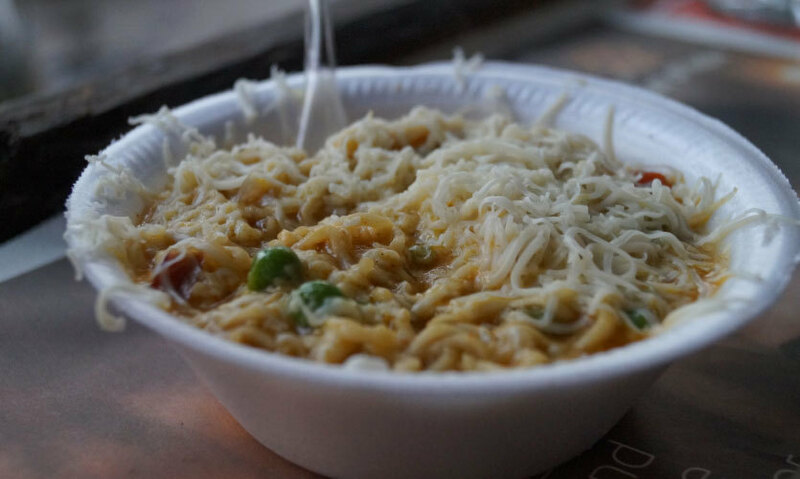 However, a date with hot Maggi on a cold afternoon is what one is always, always in the mood for! “Hey, there’s this Maggi point just round the corner, serving various types of Maggi!” exclaimed my colleague. The next thing we know was that we were already on our way to this hidden gem. 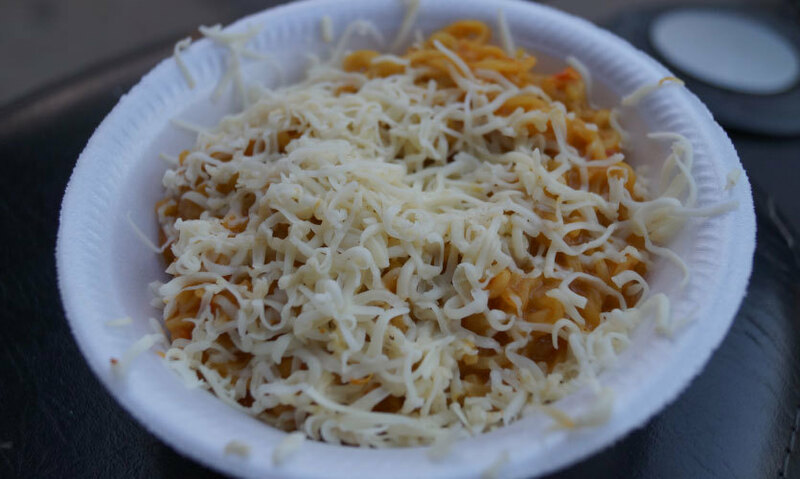 Located in Kalkaji’s H-block, just around the circle next to GRD guest house, tucked in between a local chaiwala and a paan wala, we found this joint bearing the legend, ‘Maggi Point’. When was the last time you visited a roadside stall and were greeted in the most sophisticated language? “Hello, welcome to Maggi Point. What would you like to have today?” were the first words we heard the moment we stood in front of the vendor of this stall. We were stupefied by his statement and before we could come to our senses, he astounded us by striking a conversation in fluent English (woah!). Cooh, huh?! 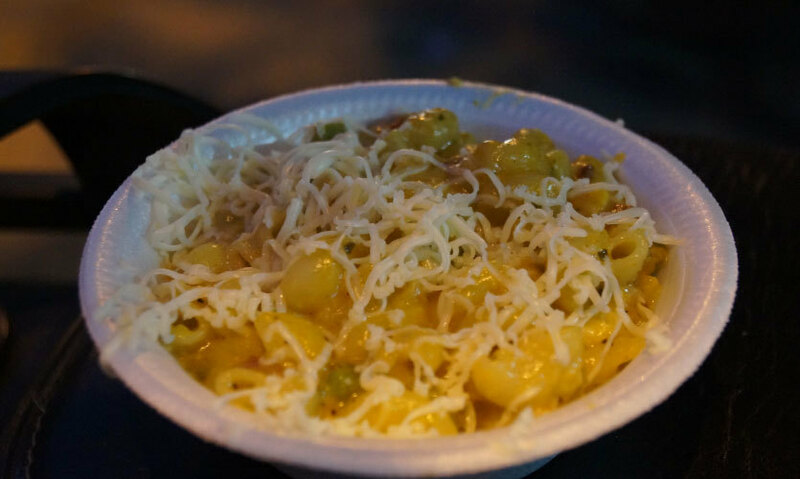 They serve 12 different kinds of Maggi and similar flavours are also available in pastas. The board just behind the counter lists out the various flavours available at this stall. Just tell him the number of the listed flavour and the same will be served to you within 5 minutes. Probing about the diversified variants, we were told that all the flavours listed are home-made! He had boxes filled with different pastes which are used in adding that tinge of yumminess to Maggi. Nostalgia hit us pretty hard just with the whiff of this one! No experiments, no added flavours, a simple, subtle Maggi was presented to us. The only difference was the use of two packets of tastemaker in one Maggi just to enhance the spiciness of this variant to justify its name. Evenly cooked Maggi and extra spice made it incredible! Now here come the astonishing part! Since it was being cooked right in front of us, we knew what was going on. 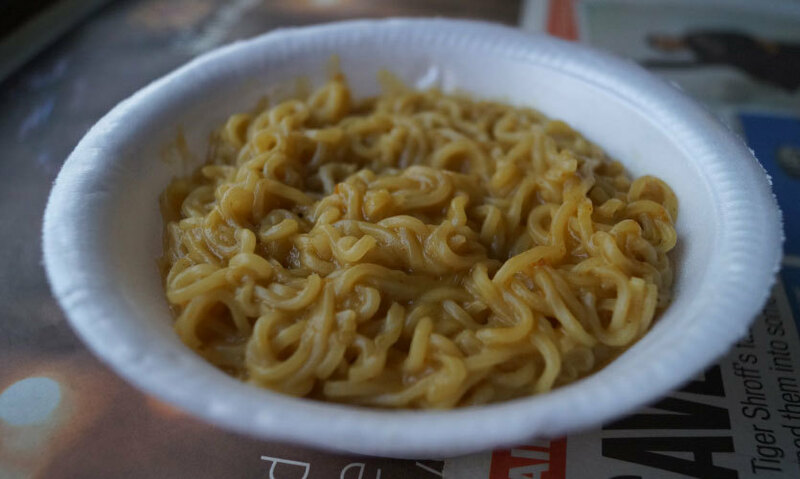 Instead of the tastemaker, he took a scoop of a paste and added it to the Maggi once it was completely boiled. The paste was of garlic and green chillies with some red chilli powder and salt. We could see the color of Maggi changing from yellow to light orange because of the paste, and were already feeling the oomph of the spices! This variant was garnished with grated cheddar cheese. What followed was exactly as we thought. Though we emptied the bowl hastily, we were guzzling water like crazy. We were again rescued by the vendor as he keeps sealed water bottles for his customers (nice!). Doing complete justice to its name, this variant is a total must try item! Chopped capsicums, onions, tomatoes and a handful of peas were added to the Maggi while it was still boiling. 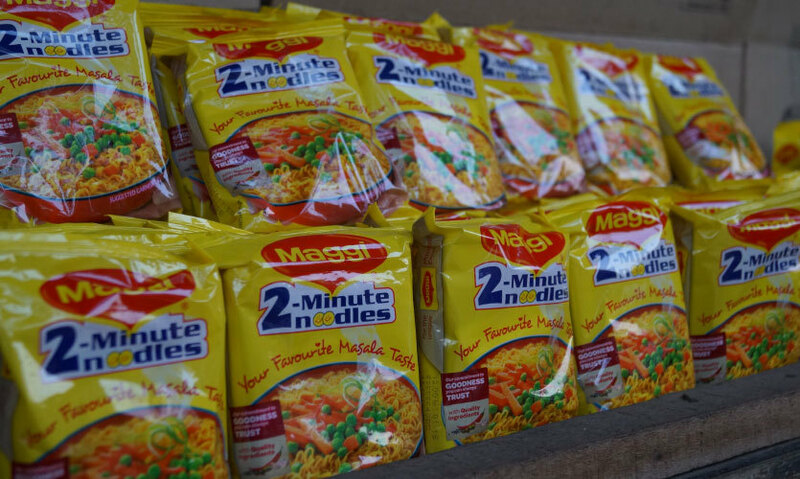 The same paste used in the variant we tried earlier was then added to the Maggi. The spiciness of the paste was neutralized to a certain extent due to the use of excess water and addition of veggies. This took extra time to be prepared, but the outcome was worth the wait. The vivacity of the spices could be felt in every morsel, the Maggi was evenly cooked and even the veggies had gone soft. This variant was also garnished with grated cheddar cheese and we happily licked our plates clean! We were already in love with their home-made flavours and hence this became our obvious choice. The paste used in this variant was prepared from ginger, garlic, salt, pepper, red chilli powder and green chilies. Being overwhelmed by the earlier variants, we were waiting desperately for this one, which somehow failed to impress us! Despite adding a good amount of paste, the taste was hardly felt. We could feel the dash of spiciness, but the essence of ginger was missing. Even though ample amount of veggies were used, this variant did not live up to the mark. We were in awe with this flavour, which led us to ordering this dish. The pasta was cooked with the tastemaker and then stirred in the garlic chili paste in a separate pan before being served with grated cheddar cheese on the top. The manner of cooking is what makes this dish stand apart. The pasta is perfectly cooked and absorbs the flavour of the paste completely, which could be felt in every bite. Going by the owner’s style of cooking pasta, we decided to give this flavour another try. We asked for the ‘Cheese Macaroni’ flavour of the pasta to be used this time. Chopped veggies were added in the pasta and cooked in the tastemaker before being stirred in ginger garlic paste. Garnished with cheddar cheese grated on top, this variant tasted far better. The pasta was evenly cooked, the spiciness was at a minimum and the veggies were properly boiled. The flavour lingered on, however the essence of ginger was still missing. Though the variants available were scrumptious, but we still found the pricing a tad on the higher side. But when hunger strikes, Maggi has proved to be the invincible saviour at all times! Do let us know your favorite flavour when you come here. The place opens at noon and stays open till 10 in the night. Happy munching!